Humanistic motives have often governed commendable causes within the church. Man seeks to gain an advantage over God even with his virtues and obedience. The celebration of Earth Day, once restricted to a fringe element at public parks, is now widely noted by the media as if it were a major national holiday. 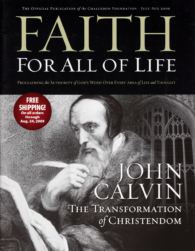 The year 2009 commemorates the 500th anniversary of the birth of John Calvin (1509–64), the greatest of the Protestant Reformers. A poem about mentoring and being mentored.